← New Feature! Add a LIVE slideshow of your market to your website! With so many delicious fresh fruits and veggies available now at farmers markets (go to Real Time Farms to find one near you! ), it is only natural to want to preserve some of the bounty for later enjoyment. 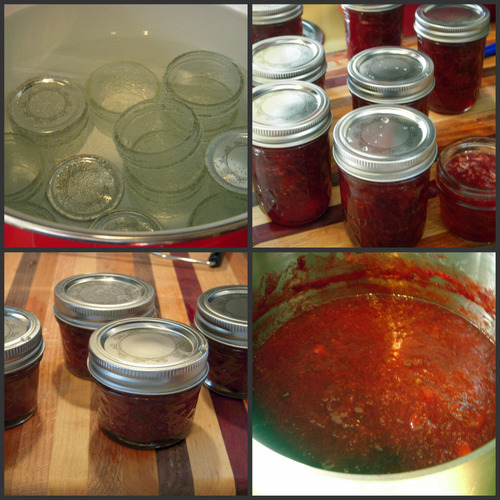 I’ve wanted to try canning for some time now, as has my sister-in-law, so we decided to test the waters together. We headed to Downtown Home & Garden to pick up supplies, and we got a bonus crash course in canning from owner Mark Hodesh and staff! 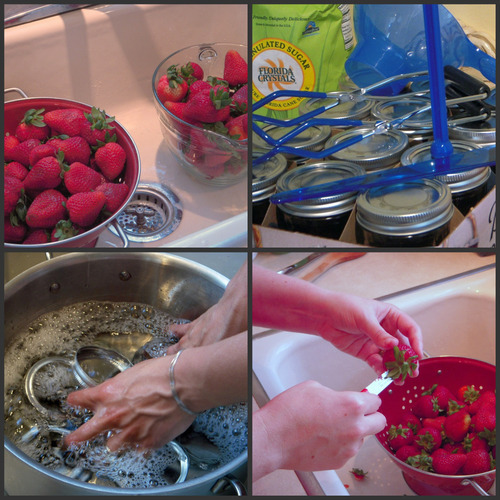 Thanks to their encouragement, the right equipment, and bags full of delicious strawberries and rhubarb, we were ready to head home and get canning! 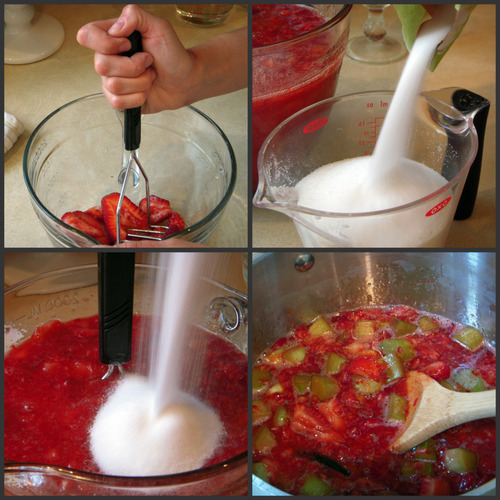 I wanted to try making a strawberry rhubarb butter, and my sis-in-law opted to stick with a classic strawberry jam. (Don’t forget to use Real Time Farms to see where you can find strawberries and rhubarb near you!) We found the Ball Blue Book Guide to Preserving to be really helpful – we read, re-read, and re-re-read the instructions to make sure we didn’t mess up along the way. And how did we do? Well, the cans all sealed properly, and the jam and fruit butter look good, but I have to confess that I’m enjoying looking at the fruits of our labor (yes, bad pun intended!) too much to open one up. I’ll keep you updated when I do, and let us know if you have a favorite item to can or a canning recipe to share! This entry was posted in In the Kitchen (recipes & more) and tagged canning, fruit butter, jam, lindsay jean hard, rhubarb, strawberries. Bookmark the permalink.